Offer valid until 30th June 2019 and subject to vehicle availability. Finance provided by Nissan Finance, Rivers Office Park, Denham Way, Maple Cross, Rickmansworth, WD3 9YS. Subject to status. Guarantees and indemnities may be required. You must be at least 18 and a UK resident (excluding the Channel Islands). Terms and conditions apply. Please refer to your local authorised Nissan dealer for further information and exact specifications. MINIMUM 20% DEPOSIT REQUIRED AND IS ONLY AVAILABLE ON N-SPORT IG-T 100 GRADE. Offer based on 6,000 miles pa, excess mileage 8p per mile. Offers not available in conjunction with any schemes or other offers. Vehicle price includes first registration fee and 12 months’ road fund licence. 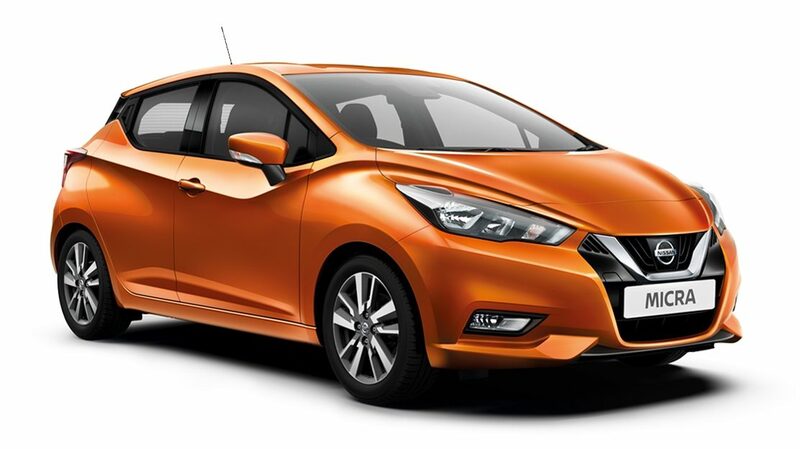 The All New Nissan Micra arrives to challenge small car standards in design, comfort and performance. The revamp of the Nissan Micra has taken a modern approach with a stylish interior and vibrant colour range to choose from. The new 5 door hatchback is the perfect city goer, with it's advanced tech making your drive easier. Nissan Intelligent Mobility is fitted as standard in the All-New Micra keeping you connected and feeling confident throughout your journey. The Micra comes in 4 specifications customising the drive around yourself, whether you like the 360 BOSE sound system or the idea of keyless entry the Micra has something for all.